UPDATED, July 15, 2010 — Luis Milán was released from prison in July 2010 under a deal between Spain, the Catholic Church and the Castro dictatorship. According to the propaganda spin, health care is one of the Cuban revolution's grandest accomplishments. Dr. Luis Milán Fernández, one of six physicians and dentists locked up during the "black spring" of March-April 2003, might disagree. Luis Milán Fernández is reportedly a medical doctor by profession. He is a member of the unofficial Colegio Médico de Cuba, Cuban Medical Association. 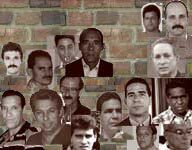 In June 2001 he and his wife, also a doctor, signed a document called "Manifiesto 2001," calling among other measures for recognition of fundamental freedoms in Cuba. Together with other health professionals they carried out a one-day hunger strike to call attention to the medical situation of detainees and other issues. During the "black spring," Milán, now 37, was convicted of violating "Law 88" and sentenced to 13 years in prison. Dr. Luis Milan Fernandez has reportedly been arbitrarily confined to a psychiatric ward since February 18, 2005 at the Boniato Prison Hospital in Santiago de Cuba. He is forced to share a cell with patients suffering from a variety of mental disorders and is prohibited from receiving any medicines or food that his family brings him. Before being moved to the hospital, Dr. Milan underwent a medical check-up at the Combinado del Este Prison in Havana during which he was diagnosed with a tumor in the left humerus, loss of hearing, pulmonary emphysema, hypertension, swollen nasal turbinates, and an enlarged liver. Dr. Milan reportedly refused to undergo treatment for these ailments, since he did not trust the medical personnel in the prison.